The construction program at the Naval Trident Missile submarine Base, Kings Bay, Georgia was the basis of this study. The total value of construction for the study was $670 million which included numerous separate construction projects over a period of 8 years. Most of the projects were competitive sealed bid designed by various A&E firms. A total of $250 million of construction was performed before RediCheck was implemented. A total of $420 million of construction was performed after the RediCheck system was adopted. No other significant changes in design, construction, or administration of the projects were implemented. Change order rates and change order types were tracked from the beginning. 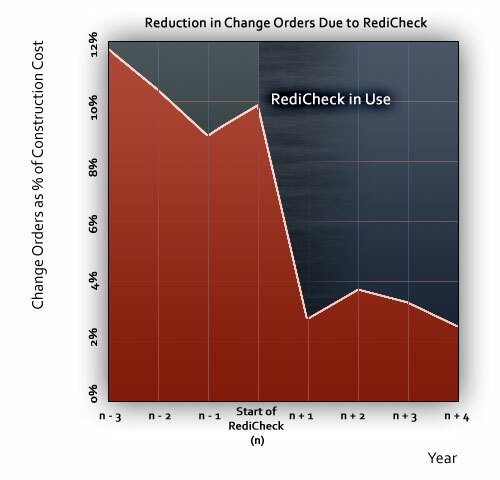 As illustrated on this graph, after implementation of the RediCheck System the project change order rate was reduced dramatically, from an average 10% to 3% of the total construction value. This reduced the total program cost of $420 million by approximately 7% of the construction value reviewed. Approximately one half of the change orders were directly attributed to design errors or omissions. The total estimated cost savings to the Navy as a result of RediCheck were estimated to be 3.5% of construction cost. This was a savings of nearly $15 million (3.5% X $420 million = $14.7 million).